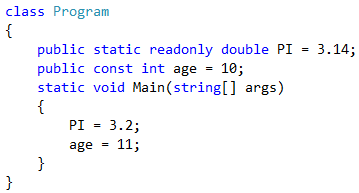 Both these words play a very important role in defining constants in an application (C#). At one sight, it seems like, both are same but exactly it is not he case. Let's understand one by one to get the clear picture. The word const itself means, it will never change. If you are specifying any variable as a const that means the value of the variable is never going to change inside the application. Please note, readonly variables can be assigned either at the time of declaration or can be assigned value inside a constructor. These two are the only places, where one can assign the value of a readonly ariable. For readonly alue assignment is done at run-time and there is no difference between a regular variable and a readonly variable in terms of memory allocation. If the value is going to fix throughout the program and is never going to change in any circumstances, then one should choose const. But on the other hand, if assignment of initial value depends on some parameter/conditions and value needs to be decide at run-time, then one can opt for readonly and based on that initial value of a readonly variable can be set. But please note, once the value is assigned, further modification is not at all possible till the lifetime of the application. Now, let's jump quickly on ildasm to prove the value assignment for both of these. 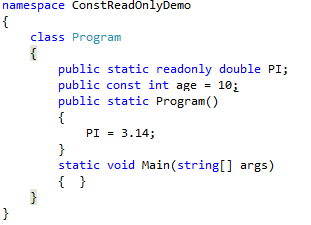 As I told earlier, that const are compile time constants and are assigned at the time of declaration itself. So, same can be proved via ildasm using IL code. In ildasm, one can see the value of const variable in hexa but for readonly variable, there is no such value assigned in PI variable in ildasm. Every time we update our site, IIS must recompile it during the first request, so the initial request takes significantly longer than subsequent ones. An easy solution for this is to tell IIS to automatically recompile our site as part of the update process. And this can be achieved using the startMode attribute in the ApplicationHost.config file.